We have a 5C1 model Fender Champ today, serial number 6871. 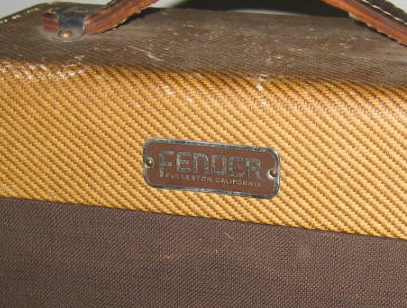 This serial number tells us this amp was made some time in early 1954. The date code stamp is a little out of focus on this great shot of the tube chart. It looks like DA which indicated january 1954. We are lucky enough to have a shot of the speaker code which is 395 402. The 402 part of the code means that the speaker was made in 1954 and the 02 indicates the second week. I haven’t been able to track down which speaker manufacturer corresponds to the 395 code, if anyone knows give me a shout. Overall, this guitar amp looks to be in pretty decent shape. The handle looks original but the power cord looks replaced. The front should have a block Fender Logo. Thanks for the tidbit, John! Excellent news, thanks. I have the same speaker in a very early 5F1 Champ (the “small box” with the 6″ speaker), and have been wondering about that code for a long time.